The heavy duty carton sealing tape hand held dispenser is designed for tapes up to 2" wide, 3" core with adjustable brake. The metal body is made in a single piece, that is more durable than an assembled body. 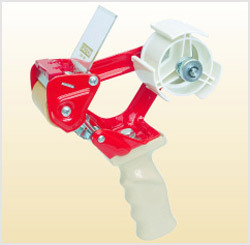 The natural rubber roller creates static to keep tape in ready to use position. Also the open gate make tape setting very easy.